very nice traditional Ryokan, 5 min. to the city center and 5 min to the ski slopes. Japanese style type room with ability to rent private onsen. Facility is definitely dated and room smells of smoke despite requested for non-smoking room. 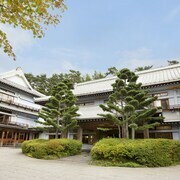 Situated in Kusatsu, this ryokan is steps from Jōshin'etsu-kōgen National Park and Kusatsu Onsen. 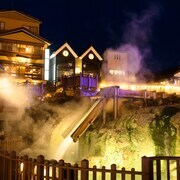 Kusatsu Hot Springs is 0.2 mi (0.3 km) away. Onsen was nice, complementary shuttle drop of to snow monkeys available but not pick up service. No tolietries in room. Enjoyed the property and onsen. Breakfast was also a nice addition. I love this place! It's not only comfortable, you get free access to coffee & tea all day + delicious breakfast in the morning. A short walk from the bus station and easy access to all the onsens you want in the little onsen town. Ichiro made sure we were well taken care of! The inn was clean, beautiful, and had plenty of amenities! We enjoyed two of the onsens in our one night stay. Ichiro makes sure that your stay is nothing short of fantastic! We would absolutely stay here again. Able to use a private onsen was nice. Hosts speak passable English so that is helpful. Charming staff tries hard to please. Wonderful rooftop private hot tub with beautiful views. Delicious multicourse authentic Japanese dinner.